Reiki is a journey to the Self in which we evolve, shift perspectives and heal on many levels. 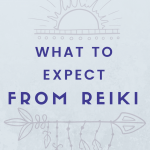 Here are 9 discoveries I made through my journey with Reiki! Intentions create the flow of energy in the system of reiki. The clarity and purity of your intention will create momentum. After recognizing the power of intention through reiki, I’ve used it in many areas of my life. I set intentions around the full moon, before my meditation or yoga practice, before I eat, before I drive and frequently through out the day. I immediately feel grounded and aware. 2. True healing is returning to your Highest Self. Reiki helped me recognize that we are all energetic beings at our core. Our tissues, feelings, thoughts, intentions, and karma are simply comprised of energy at the most basic level. Science has proven this phenomenon but reiki helps us experience it. Transforming our energy field can go to the root of the issue and transform our samskaras or habitual patterns and deeply ingrained impressions in our consciousness. When I can’t break a pattern in my thoughts or actions, I work on my energy field. I learned that some challenges are easier to resolve on an energetic level rather than on a physiological, mental or emotional level. 5. I am not alone. When I feel reiki flowing, I know that divinity is within me, and around me. It’s a powerful reminder that there is more to this world than that we can see and touch. One of my favorite practices is calling in Gods, Goddesses, Angels, Reiki masters or sources of divinity and noticing the energetic transformation each one brings. 6. Our mind, body and soul are one. Healing any one of your mind, body or soul will create healing in all of your being. I have seen my hormones balance through reiki and meditation. I’ve also witnessed how reiki creates clarity in my mind that results in a deeper connection to divinity. Reiki helps us experience oneness. 7. Everything has a frequency. Reiki helps me experience the vibrations of many different thoughts, feelings, and intentions. I observe how holding different intentions while giving myself reiki changes my vibration accordingly. I notice that reiki flows easily and effortlessly through me when I surrender to the highest good, when I call in higher sources, and when I am grateful. 8. Find your inner peace and the rest will follow. Transformation begins with us. Reiki is not about channeling a magical energy to solve all our problems. The precepts of Reiki teach us mindfulness, which is essential to creating and maintaining a high vibration. When your mind and soul are at peace, and when you’re connected to your truth, you will manifest health, abundance, love and much more. The true power lies in knowing that you have choices to make regarding your inner ecosystem (your thoughts, beliefs, and energy) which can create peace. 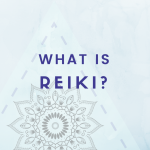 What have you discovered through reiki? Let’s chat in the comments below! I love this. Been using Reiki energy for many years now. Totally agree it is not the fix all for every issue in life but when there is a issue and one meditates with Reiki it dials up the positive energy frequency. One’s conciousness can expand and a sense of peace prevail. With a calm mind it can be easier to gain insight to solutions. Thanks so much.